Gigantopithecus blacki, the largest known species of primate, lived mainly in South China during the Pleistocene. The enormous body size of this taxon, together with its special dietary proclivity and possible relationship with hominins arouse great interest among paleoanthropologists. The dental enamel thickness of primates can indicate important information of evolution and diet adaption. 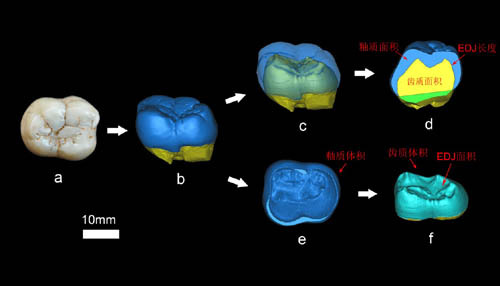 In a paper published in the journal of Acta Anthropologica Sinica 2013 (3), ZHANG Lizhao, Institute of Vertebrate Paleontology and Paleoanthropology (IVPP), Chinese Academy of Sciences, and his advisor Dr. ZHAO Lingxia, reconstructed teeth of Gigantopithecus blacki using micro-CT, measured dental enamel thickness and compared them with the dentition of other primates, suggesting that thick dental enamel of Gigantopithecus blacki shared with the early hominins may be evolved from one branch of Miocene fossil ape or is the result of parallel evolution with modern humans. 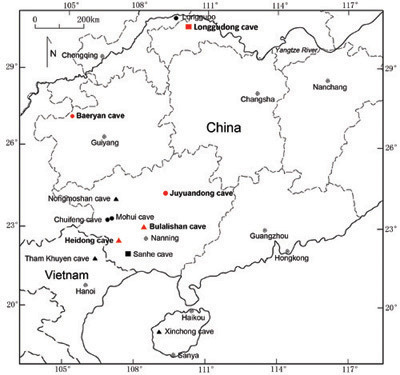 Researchers selected 18 unworn or lightly worn molars of Gigantopithecus blacki from more than 1,000 teeth unearthed at 5 different fossil sites: Juyuandong cave, Baeryan Cave, Longgudong cave, Heidong cave and Bulalishan cave. Their geological age was from early Pleistocene to Middle Pleistocene. Traditional methods of enamel thickness measurements can destroy the precious fossil teeth. In this experiment, researchers employed non-destructive micro CT techniques to scan the teeth, and then created virtual teeth models from which enamel thickness were measured precisely on computer. Two parameters of enamel thickness are measured: average enamel thickness (AET) and relative enamel thickness (RET). 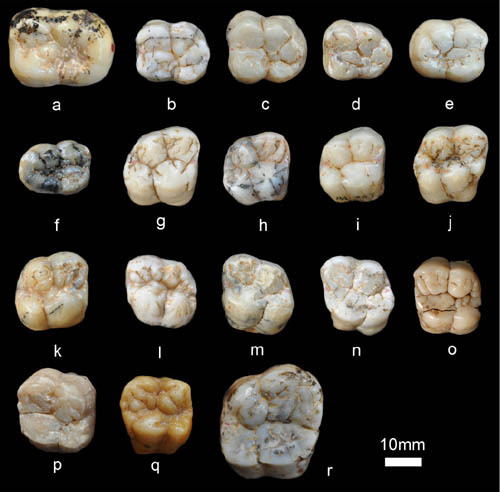 The results show that Gigantopithecus blacki has the thickest average enamel thickness (2.45mm), which is almost twice as the enamel thickness of modern human. Paranthropus robustus, South African early Homo and Ouranopithecus macedoniensis have a close value of average enamel thickness of Gigantopithecus blacki. With considerations of body and tooth size, the relative enamel thickness of Gigantopithecus blacki (20.41) is no longer the thickest one. This relative measurement indicates that Gigantopithecus blacki belongs to a category of “thick-enamel” primate along with modern humans, Australopithecus , East African Early Homo, Asian Homo erectus and some Miocene fossil apes (e.g. Proconsul nyanzae, Afropithecus turkanensis, Pierolapithecus, Griphopithecus and Sivapithecus), but the relative enamel thickness of Gigantopithecus blacki is thinner than those of South African early Homo hominins, Paranthropus and Ouranopithecus macedoniensis. The extremely thick enamel of Gigantopithecus blacki molars are evidently well used for grinding and crushing for a long period of life history. The dietary proclivities may primarily focus on tough or fibrous vegetation. The thick enamel, common characteristic of Gigantopithecus blacki and hominins, can be interpreted in two ways. First, it was possible that the last common ancestors of early hominins probably had thick enamel, and Gigantopithecus blacki may be an extinct branch derived from early hominins during the very beginning of its evolution. Gigantopithecus blacki can be also evolved from one branch of Miocene fossil ape whose teeth enamel is thick, and thick enamel shared with the early hominins and modern humans is the result of parallel evolution. This work was supported by the National Science Foundation of China and the Strategic Priority Research Program of the Chinese Academy of Sciences.